Let's get the basics out of the way. In order to use any kind of chroma keyer, whether it's in your editing program or switcher, you are going to need a solid green or blue background for it to work. There are exceptions to this but in general you will need something like this Square Perfect green muslin backdrop. Products like this run $20-40 for material only and $100-$200 with stand kits. Some kits even come with lighting. Speaking of lighting we come to the core issue with chroma keying. Nothing effects the quality of your key, and your production, like lighting. The diagram below shows a standard 3 point lighting setup for your talent, the Key, Fill, Kicker combo which you can read about extensively. 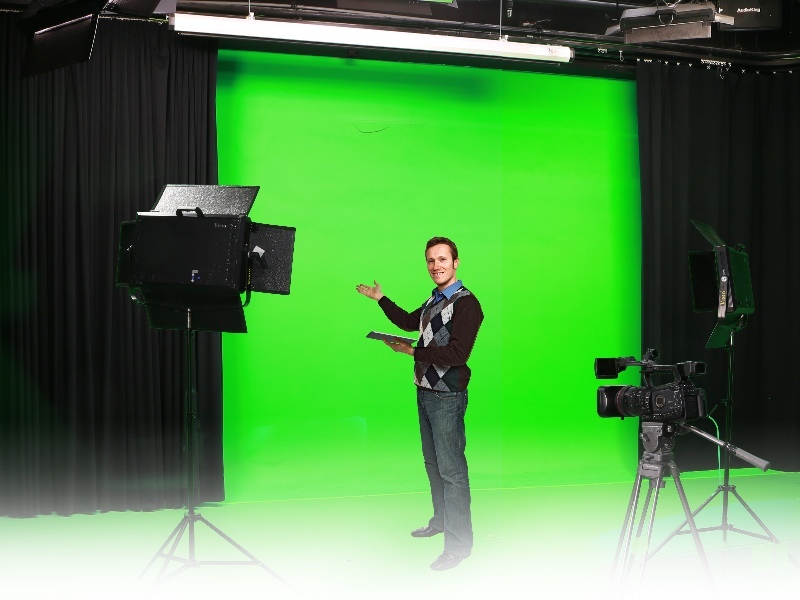 In addition, we have two softboxes to light only the green screen. The keyer is looking for Saturation (not how bright, but how green something is) so it's important to neither underlight it or overlight it. You can see in the picture to the right that the backdrop is evenly light and fairly well green. However the 'desk' area is wrinklyed and poorly lit. In this case a footer light would be ideal to fill that area and those shadows but keep it well flagged (block the light) so that it doesn't disturb your talent's lighting. is the term we use to describe light bouncing off the greenscreen on to the talent. Many keyers have a function called spill suppression which helps add the opposite color being keyed onto the talent, but it's best not to have to use it in the first place. This can be done most effectively by seperating the talent from the backdrop. You don't always have a lot of room to work with but placing your talent halfway between the camera and backdrop is a good rule of thumb. The kicker will help reduce some of the spill around the head and shoulders too. For both controlling spill on the talent and getting a good even wash on the backdrop we want to light them seperately; they have different needs. For your talent you will want to light them for the environment they are going to be in. Pouring 2000 watts of flourescent lighting on your talent will tell the viewer they are not really where they are more than a fake looking background will: light your talent for the environment that are going to be keyed into. If possible match the lighting of the virtual set in both direction and color using gels.